Through Thanksgiving week 2017, the U.S. stock market (S&P 500) returned 362% from its nadir in March 2009. On a cyclically adjusted basis, investors are now willing to pay a price of $31.58 for each dollar of earnings across companies in the S&P 500 index. Such an outlay is nearly triple the decidedly miserly price of $11.91 at the market’s depths. Aside from the sheer shock value of such numbers, one interesting observation is that nearly half of the stock market’s gains have come not from economic or corporate growth, but from nothing other than the willingness of investors to pay far more for stocks. A second observation is that a comparable valuation driven stock market gain over the next 8.5 years would have investors paying $83.74 per dollar of earnings. Considering the maximum valuation paid during the ’99 – ’00 tech/internet bubble was $43.53, it is doubtful the market can, or will, deliver comparable gains in future years. History and valuation acknowledged, we note stock markets have been decidedly calm and upwardly biased in recent months. How can this be if the best days for valuation driven returns are behind us, and what does this mean for stocks going forward? Where are we in the economic cycle and how does corporate growth factor in? Most importantly, what should investors be expecting and what actions should they take in their portfolios now? 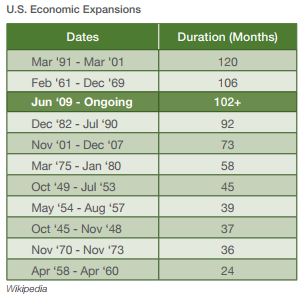 At present, the current U.S. economic expansion ranks as the third longest in post WWII history.Â Not surprisingly, the U.S. stock market has risen alongside economic growth. Market volatility has also been uncharacteristically benign throughout 2017. Such results seem to have diminished investor concerns, perhaps to the point of complacency. As evidence, consider the VIX Index shown in the following graph. This metric, often dubbed the market’s “fear gauge,” has declined to an all time historic low – less than half of its 20 year average. Meanwhile, stock market valuations have steadily expanded throughout the recovery. Historically speaking such valuations have led to meager, if not negative, go-forward returns. So how should investors respond to this mix of ingredients? The first step is to understand the fundamentals as they are. â€¢ We are in the later innings of the economic ball game. â€¢ Diminished volatility is an anomaly that will ultimately prove fleeting. Market behavior, in other words, is likely to “revert” back to historic norms. â€¢ Future returns are highly unlikely to match those of the past 8.5 years, not even close. â€¢ A broadly diversified portfolio (i.e. containing more than just stocks) is designed to weather the ups and downs of various asset classes. Diversification within the portfolio causes some assets to do better when others are doing poorly. The goal is to use volatility (i.e. declines) in any particular asset category as an opportunity to buy low and sell high.Â Volatility should be embraced as a weapon, not a weakness. â€¢ Market timing is not possible and requires not one but two impossible decisions – when to get out and when to get back in. The fact there is no reliable way to determine either point in time leads people playing this game to do so out of emotion not science. As shown below, the results are awful. In the end, it is simply not possible to time markets, so take the strategy off the table. Has the current economic recovery been among the longest in history? Has the U.S. stock market recovered dramatically? 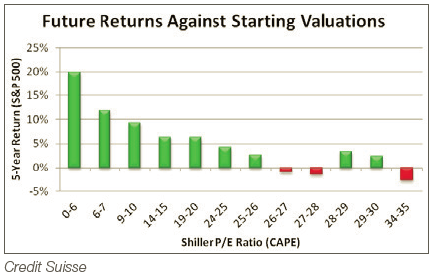 Are valuations stretched and is stock market volatility uncharacteristically low? Without a doubt, the answer to each question is an emphatic YES. Knowledge of these facts serves to keep us emotionally centered and well grounded as to likely future developments. These facts are not, however, a call to action. Investment success never has and never will be dependent on “getting in and getting out.” Case in point, nearly all of these cautionary observations could have been made, and were made, at this time last year. Selling stocks, delaying investment, hiding in cash…..an investor taking such actions on Black Friday of last year would have missed out on the 24.2% gain in the U.S. stock market over the following 12 months. Such an outcome would have been a sizable failure, an unfortunate opportunity lost by those not participating adequately. This was just one year. What about the past 20? 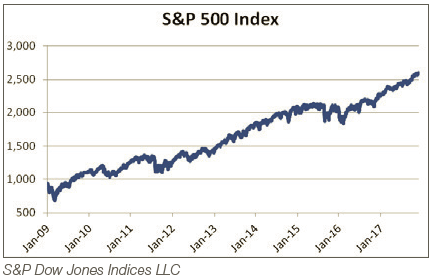 The 60/40 portfolio in the above graph performed admirably over the past two decades – a period that included not one but two catastrophic stock market declines. It delivered results far beyond those of the average investor and comparable to the domestic equity market. It also did so with about half of the volatility or “down side risk” of stocks. Such an outcome was not born out of herculean portfolio actions or well timed bets, but because none were attempted. 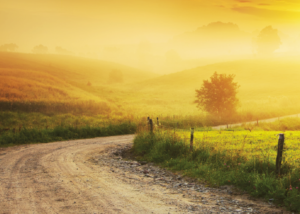 Simply stated, a well-diversified portfolio works for those with patience. 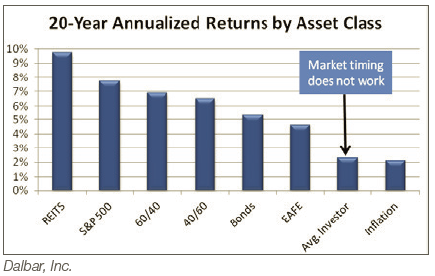 The investment markets are prewired to deliver return, not necessarily every time, but definitely over time. Patience is necessary; stay the course.